A recent article in Nature Climate Change has spurred a new chapter in the lively scholarly debate over the potential relationship between climate change and violent conflict. We agree with the article’s authors that there are several forms of sampling bias in this field, including how regions are selected for analysis. But simply addressing this sampling bias will not resolve many of the academic controversies that have raged since the mid-2000s. Our recently published study in International Studies Review examines the mechanisms connecting climate change or its consequences to violent conflict and concludes that to move this research agenda forward, researchers must pay deeper attention to the “nuts and bolts” that shape both climate-related conflicts and our understanding of them. In “Climate Change and Violent Conflict in East Africa: Integrating Qualitative and Quantitative Research to Probe the Mechanisms,” we reviewed both quantitative and qualitative literature to explore the mechanisms through which climate change may affect the risk of violent conflict or the dynamics of ongoing hostilities. Before this, no one had systematically examined climate-conflict mechanisms in both quantitative and qualitative studies. Qualitative scholarship is systematically excluded from most literature reviews in this field, despite its merits in exploring mechanisms and developing theory. We focused on one of the most studied regions, East Africa, which enabled us to review a comparably large sample of 43 unique, empirically grounded articles. We identified four categories of mechanisms. Worsening livelihood conditions: In East Africa, a significant proportion of the population depends on rain-fed agriculture and pastoralism, so the degradation of the natural environment has detrimental effects on people’s livelihoods. When these environmental changes—such as the decreased freshwater, degraded grazing lands, or damaged cropland—interact with other pressures on livelihoods, such as political marginalization or unfair land distribution, competing groups may become more likely to solve conflicts through violence or to secure resources by force. Loss of income from agriculture or pastoralism decrease the opportunity costs of joining an armed group. Importantly, this mechanism does not assume that environmental changes always worsen livelihoods, nor that violence is inevitable. Instead, it focuses on the increased risk that violence will arise under those circumstances. Increasing migration and changing pastoral mobility patterns: Frequently cited in research linking climate change with violent conflict in East Africa, migration and pastoral mobility affects climate-related conflict in two primary ways. First, in areas with high numbers of new arrivals, the migrants can place an additional burden on the economic resource base, and thus increase the risk of local resource conflicts. By moving their herds to areas with better water and pasture, pastoralists may also end up closer to other groups, inciting competition over shared resources or making them more vulnerable to attack. Second, migration and changing pastoral mobility patterns bring together communities that may not share institutions for resolving conflicts. Normally, negotiated access and customary laws bind pastoralists as they follow their customary mobility patterns, lowering the risk of violent conflict. If they take new trekking routes, these traditional institutions may be non-existent or unable to cope with the increased pressure, thereby increasing the risk of violence between pastoralists and other groups. Tactical considerations: Some studies focus on how weather patterns and climate variability influence the tactical considerations made by armed groups. For example, climate may affect the level of camouflage or the mobility of forces and their supplies. Importantly, explanations that focus on how climate-related environmental change alters the tactical considerations of armed groups do not focus on why conflict occurs. Whereas the first two mechanisms describe how environmental change increases the risk that violent conflict will occur, tactical considerations by armed groups instead shape how it is conducted. Elite exploitation of local grievances: The bulk of East Africa’s resource-related violent conflicts occur between loosely organized communal groups, leading to relatively low levels of battle-related deaths. In some instances, such communal conflicts become entangled with more organized forms of violence, like civil wars, through the elite exploitation of local grievances. By instigating or fueling inter-group violence, political elites can crush political opponents, divert attention away from the government’s shortcomings, or ensure the continued support of groups that depend on elites. This mechanism shows how local resource conflicts can be linked to regional and national power struggles. We took away three lessons from this review. First, there are key differences between the first two mechanisms, which focus on the causes of conflicts, and the last two mechanisms, which focus on the dynamics of ongoing hostilities. For instance, livestock raiding occurs in regions plagued by worsening livelihood conditions (such as drought and damaged crops)—but also in regions with thick vegetation and recent rainfalls. Scrutinizing the mechanisms at work in these seemingly contradictory findings reveals that the researchers in these studies focused on different aspects of the conflicts: why livestock raiders engage in violence, and when and where they decide to do so. Thus, the findings are not contradictory, but instead focus on different parts of the conflict cycle. Second, both the temporal and spatial dimensions of climate change are key. Climate change is a long-term process, but most research focuses on short-term changes and overlooks the long-term impacts. These long-term impacts include the gradual consequences of changes in precipitation and temperature, as well as the long-term impacts of sudden-onset and recurring disasters. Spatially, we need to ask, where is climate-related environmental change most likely to affect the risk and dynamics of violent conflict? Research shows that violence does not necessary occur in the location most heavily affected by climate change, but rather in places that have relatively good supplies of natural resources, such as water sources or grazing areas. And, we must not only dig deeper into how violence plays out and moves across geographies, but also rethink how we understand resource scarcity. Often, we consider an individual, group, or area as resource scarce when they have fewer resources than they did before. But it is equally important to think of scarcity as the condition of having fewer resources as compared to other individuals, groups or areas. Finally, violent conflict does not arise in a political vacuum and climate change does not mechanically determine human behavior. Both qualitative and quantitative research emphasizes the importance of studying the climate-conflict linkage in its political context. Placing climate-conflict research in its appropriate political context allows us to analyze the role of human agency—and thus we can also explore the political options for preventing violence. We need to continue focusing on the cases where the risk of violence is high and where violence occurs. Careful analysis of those instances could deepen our understanding of these unique cases. But we ought to pay equal attention to the cases where climate impacts are severe, but differences are peacefully resolved. Paying greater attention to the “nuts and bolts” of the link between climate change and violent conflict may not only bring some closure to academic debates based on theoretical misunderstandings. But it can teach us important lessons about the causes and resolution of climate-related violent conflict—and thus help us reduce the adverse effects of climate change. Malin Mobjörk, PhD, is a senior researcher and the Director of the Climate Change and Risk programme at Stockholm International Peace Research Institute (SIPRI). During spring 2018, she is also a Public Policy Fellow at Woodrow Wilson Center. Follow her on Twitter @MalinMobjork. Sebastian van Baalen is a PhD Candidate at the Department of Peace and Conflict Research at Uppsala University, Sweden. 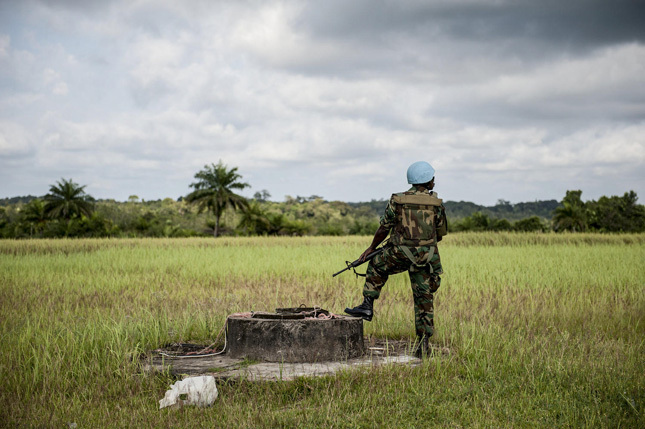 Photo Credit: A Ghanaian peacekeeper with the UN Mission in Liberia (UNMIL) is pictured on guard duty during a visit by Karin Landgren, Special Representative of the Secretary-General and Head of UNMIL, in Cestos City, Liberia. November 2012. Photo by UN Photo/Staton Winter.